Reflections and Ruminations: Our need to see our works finished may be our stumbling block towards humility. Our need to see our works finished may be our stumbling block towards humility. I know that what I am about to write will be somewhat controversial. But I also do have a sense that there is a great truth in it. Understood wrongly, it may even think that I am somehow inimical towards finishing one’s work or completing one’s tasks in life. I am not. There is a whole lot of virtue in making sure that one’s work and efforts in life get completed as far as possible, applying in all tasks that we set out to do the best that we can. No successful project as been accomplished with efforts that are half-baked and sloppy. This is a fact. But there is also another aspect of the truth that there is also a virtue in accepting the fact that we sometimes do not see the end, result or success of our efforts and endeavours, and that all that matters is that we have done our small part in contributing to the final product, and be contented that we did not taste the fruits of our labours in our lifetime. Nurturing this helps tremendously in developing in our lives the virtue of humility. This reality hits me whenever I visit medieval Cathedrals in Europe. Walking through the ancient portals into their magnificent interiors, often filled with brilliant and breathtaking stained glass windows depicting scenes from both the Old and New Testaments of the Bible, most eyes are looking at things above. But I am also drawn to look at the things that are not all that breathtaking, like the flooring or the lower portions of columns and arches. These Cathedrals were not built in a few years. In fact, many of the great ones like Chartres and Reims took more than 60 years to be completed. The Notre Dame in Paris was only completed 200 years after its groundbreaking, and in Barcelona, Spain, the regal Familia Sagrada’s imposing structure hasn’t even been completed since construction began in 1882, and it is scheduled to be finished only in 2026, making it an estimated 144 year-long project. The stone cutters and those workmen and labourers who laid the floorings and bottoms of those walls and pillars most probably didn’t see the end of the work that they began. Yet, we see the fruit of their labours in their glory now. 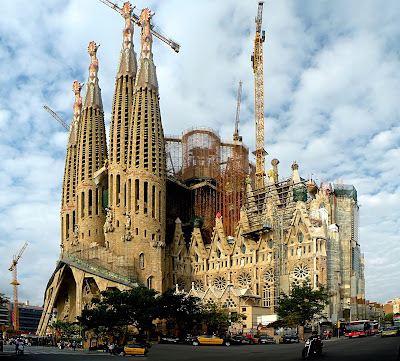 In fact, the architect of Sagrada Familia, Antoni Gaudi himself died in 1926 and is buried within the Sagrada Familia itself. There is a lot of humility that is unseen in these Cathedrals. There is also a lot of the finished beauty, majesty and magnificence of the completed work that was not seen by those involved in the construction of those buildings themselves. This truth was very likely in the minds of those many stone cutters, brick layers, artisans and architects as they undertook these long term projects. What drove them to just be contented with their small tasks must have been the knowledge (and faith) that all was required of them was to put in their best in the little tasks that lay before them. We who live in an age of the ‘instant’ have developed a resistance to this mind that fosters humility of heart. There is much to be lauded for the advancement of technology and science which has given rise to the speed at which projects that are massive are completed. But there is a downside to speed, which isn’t easily noticed. It can become an obsession and an addiction and we begin to think that it is our right to see the fruits of all our labours in our lifetime. The greats of the Old Testament - Moses, Abraham, all of the Prophets - all of them experienced this 'incompletion' in their lives. Moses was told that he would lead the Hebrew people to the Promised Land, but he himself didn't get to step into it. But he did lead them there. Abraham was promised that his descendants would number as many as the stars, yet he died with only one child. Notice that God didn't promise him that he would see his descendants with his own eyes. All the Prophets spoke about the Messiah in various ways, yet not one except John the Baptist saw him, but even then, didn't see how Jesus would realise the prophecies of old, as he died before Jesus fulfilled the Father's will. I have met and ministered to so many people who have either struggled with or maybe even lost their faith in God's love and presence and guidance because in their lives they have not seen God's promises fulfilled. Sick loved ones didn't get healed and succumbed to their illness and died. Marriages have failed apart despite attempts at bridging the chasm that became bigger between the spouses. Businesses have tanked and friends experienced betrayal. Hearts have been broken and the wounds have been deep and raw. These are just some of the ways in which people have believed that God had reneged on his covenant of love. We need to have what is called a meta-narrative when we talk about God's being with us. His being with us requires us to sometimes experience these Calvary moments, and to face them with faith requires of us to do at least two things - one, to always see Christ's passion as the model of how to face our struggles with pain, suffering and even disappointment, and two, to be humble and somehow be able to say with deep faith that I don't need to understand nor see the fruit of my faith in its completed glory with every happiness defined on my terms. Our faith life is ultimately a call to enter into mystery. Even when I die with my hopes and dreams unfinished, as long as I have put great love and effort in all that I have done, it is still ok. My life is not the Cathedral. It was just a small part of the cornice of God's Cathedral. David Brooks wrote in his book ‘The Road to Character’ about two kinds of virtues that we develop in life – the resume virtues and the eulogy virtues. The resume virtues are those that one lists in one’s resume and these are attainable very often with due diligence, hard work and much effort. These we bring to the marketplace. The eulogy virtues are the ones that are others talk about or mention during our eulogies when we die. They don’t normally have certificates or citations that show that we have them. They are seen writ large in the lives we lead – kindness, humility, compassion, honesty and longsuffering are but a few examples. They are not projects to be accomplished, but ways in which we live. These are the cathedrals that we leave behind unfinished when we die. Many a time, when I speak to people about the life of holiness and sanctification, the idea I want to stress is that these are not short term projects that we see the completion of in our lifetime. It’s always a work-in-process. We often say that we are ‘practicing Catholics’ and there is a truth in that. No one is a perfected Catholic. We are all in some ways honing our skills and trying to attain some degree of mastery in the spiritual life, never becoming masters ourselves. I have mentioned in quite a few blogs in the past Karl Rahner’s quote that “In the torment of the insufficiency of everything attainable, all symphonies in life remain unfinished”. Our accepting and understanding this, I believe, is one of the keys to developing a truly humble spirit and a tender heart. Unfinished... Not meant to be finished, just sowing seeds, the fruits are not mine to taste. Yes, I pray whoever eats the fruits will find them nourishing. Thank you for the reminders... God Bless you for the prayerful and reflective sharing. Pax. Karl Rahner’s quote that “In the torment of the insufficiency of everything attainable, all symphonies in life remain unfinished”......and that’s how it should be .....all symphonies in LIFE should remain un-finished! For life is a mystery and to really live & experience Life one has to enter into its mystery.......the mystery of which can end only when the final curtain is drawn. This explains why in the arena of art, novels and poems too, some great artists and authors have left their works purposely (?) un-finished. Something “unfinished” engages one’s imagination, invites the beholder to fantasize, to enter into a “communion “ with the author of the work. Perhaps, it may even allow one a palpable experience of sharing the daunting task of “creating” or “birthing” somewhat akin to the pangs of child-birth. Besides, a “finished “ piece can be seen to imply a completeness or perfection - which - in reality - cannot be realised in this world since perfection lies only with and in the One who is Perfection itself! Thank you for a reflective piece. God bless you,Fr. A timely reminder of choosing to be last and not first. Thank you Father for this reminder.